We are on 7 hectares in Pukekohe, just south of Auckland, New Zealand. The property is a former kiwifruit orchard with a small woodlot in a gully at the rear of the property. Soils are highly productive and much of the area is devoted to vegetable production, especially potato, onion and brassicas. 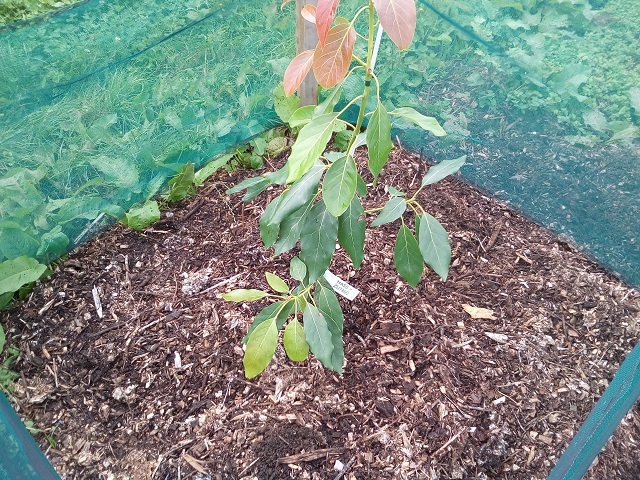 We have planted a trial orchard of 50 avocado trees, variety Hass with Bacon pollinators. Because the soil bulk density is 1.0 and Avocados prefer lighter soil, we have used biochar to try and ‘lighten’ the soil and to improve drainage and biological activity. First the orchard was ploughed and then graded into berms, just off contour for drainage. 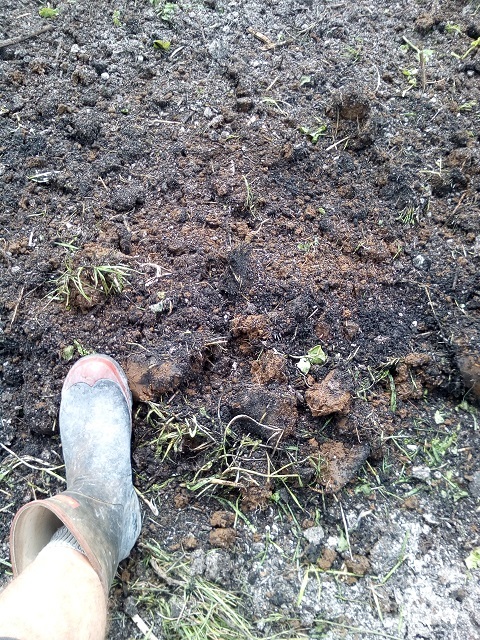 A cover crop was grown until compost, gypsum and biochar were added to the soil and rotary hoed in. Satellite photos taken the day we rotary hoed the soil prior to planting show how dark the soil is now compared to our neighbours. Trees were planted March 2018 and the soil mulched using rotted wood mulch from an arborist. They suffered in cold wet conditions for winter 2018 and some were grazed by escaped cattle, but the trees are now growing strongly as of Feb 2019. A few have their first fruit, but these have been taken off. We have begun to inter-plant with Tamarillo to fill the gaps until the avos get bigger and about half of the trial planting have done well, quarter have died and quarter are struggling. I put this down to weeds as they weren’t weeded when we were away for 6 weeks. 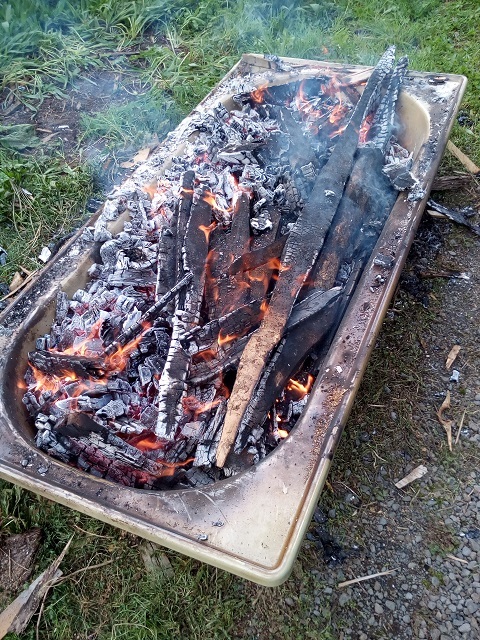 We continue to make biochar using an old bath. Timber that is too small or rotten for fire wood or otherwise useless gets used. Mostly it comes from thinning the woodlot and sawmill waste. The main criteria for me is it has to give a decent volume of char and not require much work to do it. Almost done. Will be quenched by filling the bath with water. 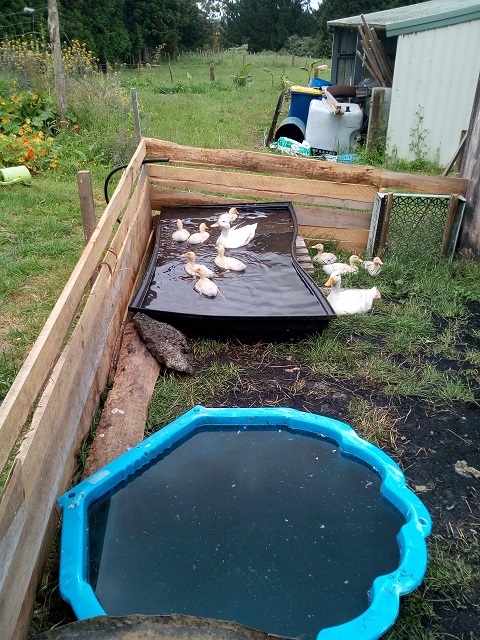 I get a bathtub full of char each time which goes into the chicken house. After a few months of adding char every few weeks, we shovel it out and either compost it or rotary hoe it into garden beds. We don’t plant directly into those beds for a while. It is burning the enamel off the bath now after a few burns but is a handy size, easy to quench and more tolerant of wet wood etc. I have soaked the char in duck pond water as well which gets it going biologically. I have pretty much given up on the TLUD. Too much time cutting up timber to fit and I always forget it and return to a pile of ash.